while in treatment. Plus, brushing and flossing are no problem. They are also comfortable, with no metal to cause mouth abrasions during treatment. And no metal and wires usually means you spend less time in your doctor’s office getting adjustments. Invisalign also allows you to view your own virtual treatment plan when you start so you can see how your straight teeth will look when your treatment is complete. 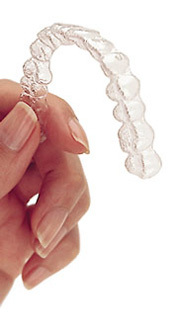 For more information on Invisalign, you can visit Invisalign.